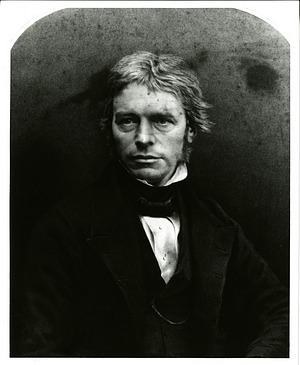 Joseph Henry, who became Secretary of the Smithsonian upon its establishment in 1846, was the first in a long line of scientists selected to lead the Institution. Henry was a physicist who had taught for some twenty years, first at a college preparatory school in New York and then at Princeton. During these years, he became known among scientists throughout the United States and Europe for his groundbreaking research in electromagnetism. Henry was an innovative teacher whose interest in the relatively new field of electromagnetism, combined with his belief in the importance of demonstrating scientific phenomena to his students, led him to develop electromagnets that were far more powerful than any previously made. Using these electromagnets to demonstrate both dramatic and subtle effects to his students and to explore electromagnetism in the laboratory, he developed the first motor based on magnetic attraction and repulsion (a forerunner of a modern DC or direct current motor) and a primitive form of the electromagnetic telegraph. Although he did not further develop these devices, his work paved the way for the development of motors by others and for Samuel F. B. Morse's telegraph. He also discovered important principles of electromagnetic induction, for which he was honored in 1893, when the International Congress of Electricians named the unit of induction the "henry." Henry's work in electromagnetism not only made important contributions to science, but helped lay the groundwork for modern industry and telecommunications. 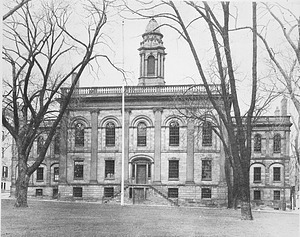 The field of electromagnetism was only six years old when Henry began teaching at the Albany Academy in New York. Danish scientist Hans Christian Oersted had discovered in 1820 that an electrical current in a wire from a battery caused a nearby compass needle to deflect. Eager to demonstrate electromagnetic phenomena to his students, Henry built upon the work of English scientist William Sturgeon, who in 1825 discovered that wrapping a wire around an iron core enhanced the magnetic effect. Henry experimented with various parameters: insulating the wire so that multiple layers could be wound on the core (Sturgeon had used bare wire with a layer of insulating shellac on the iron); winding several coils on the same core; connecting batteries end-to-end (in series) to increase the intensity (voltage) and side-by side (in parallel—an alternative arrangement was to have larger plates in a single battery) to increase the quantity (current). He found that a high-intensity source worked best with the coils connected to end-to-end (in series, making a single coil), while a high quantity source was better with the coil ends connected together (in parallel). This was unknowingly a demonstration of Ohm's Law which had been published in 1826, but was not yet widely known or understood. By 1831, he reported making an electromagnet that could lift 750 pounds, over thirty-five times its own weight (with coils in parallel, using a quantity battery).1 Henry later remarked that these early electromagnets "possessed magnetic power superior to that of any before known. "2 By 1833, he had built one that could lift over 3,300 pounds. Henry detailed his research and findings in letters to colleagues, including Benjamin Silliman, Sr. (1830), (1831), John Henry (1831), Edward Hitchcock (1832), and Parker Cleaveland (1831), (1832). In working to make more efficient use of his batteries and maximize the power of his electromagnets, Henry made basic discoveries in electromagnetism, including what specific types of electrical input should be matched to what types of circuits depending on the effects desired. These basic discoveries led him to develop both a motor and a bell-ringing device that was a precursor to Morse's electromagnetic telegraph. The challenge in developing a motor was to use a battery current to produce not only a mechanical effect, but continuous mechanical movement. Henry's reciprocating motor consisted of a straight electromagnet balanced on an axis with its ends above the north poles of two vertical permanent magnets. Pairs of wires, attached to each end of the electromagnet, alternately dipped into cups of mercury, acting as terminals of an electrochemical cell. As the wires alternately moved into and out of the cups, thus making and breaking a circuit, the polarity of the electromagnet was repeatedly reversed, which produced a continuous rocking motion. Henry was able to achieve "uniform motion, at the rate of seventy-five vibrations in a minute . . . for more than an hour. 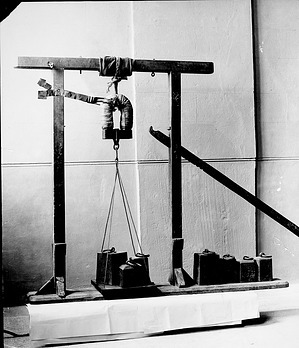 "3 Although Henry's device contained the elements of a modern DC motor, Henry saw it primarily as a "philosophical toy" for classroom demonstrations, and did not attempt to patent it. In reference to the magnet's back-and-forth motion, Henry referred to this device as his "sheeps tail." While Samuel Morse was developing his telegraph, he sought advice and public support from Joseph Henry. 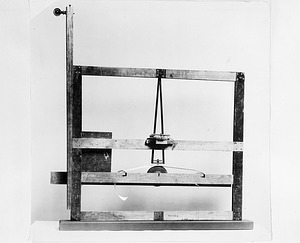 In a letter that would later be cited to establish the telegraph's origin, Henry wrote to Morse in 1842 that although such an invention had been suggested "by various persons from the time of Franklin to the present," it was not "until within the last few years or since the discoveries in electro-magnetism" that it had been practicable. Henry went on to say that "little credit can be claimed" for the telegraph's invention "since it is one which would naturally arise in the mind of almost any person familiar with the phenomena of electricity," but he supported Morse's design over the needle telegraphs being proposed by European scientists. Three years later, the publication of a book on the telegraph by one of Morse's chief assistants, Alfred Vail, failed to credit Henry's contributions and marked the beginning of a dispute between Henry and Morse6 that lasted many years. While Joseph Henry was required to put much of his own research aside once he came to Washington, DC, in 1846, his career as a physicist had a profound impact on his leadership of the Smithsonian. Henry's top priority was to support basic research, and his dedication to this vision throughout his secretaryship brought the Institution worldwide respect. Roger Sherman, "Joseph Henry’s Contributions to the Electromagnet and the Electric Motor," Smithsonian Institution. David Hochfelder, "Joseph Henry: Inventor of the Telegraph?," Smithsonian Institution Archives. 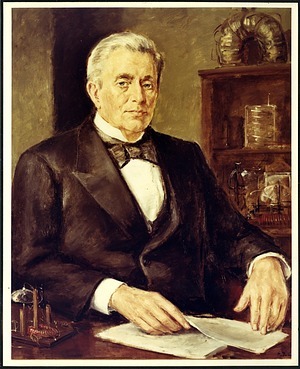 Frank Rives Millikan, "Joseph Henry: Father of the Weather Service," Smithsonian Institution Archives. Courtney Esposito, "A Forgotten History: Alfred Vail and Samuel Morse," The Bigger Picture (blog), Smithsonian Institution Archives, May 24, 2011. Liz O'Brien, Henry, Melville and the Smithsonian, Unbound (blog), Smithsonian Libraries, September 11, 2015.